The new year brought a new milestone in my life. I graduated from Wayne State University, with a master’s degree in communications/journalism. That fact, possessing a Wayne State degree as an African-American student, makes me something of a rarity, as Bridge's coverage of the struggles of African-American students at Wayne makes clear. As expected, my program was quite competitive and demanding, with top-notch professors guiding our way. Unlike what many may know of undergraduate programs, where specific courses are required, my master's schedule did not impose general course requirements. Once one enters "post-grad" work, the focus is more concentrated. Presumably, one becomes more invested in completing their program since he/she is in one’s chosen field of interest. This is not always the case with African-American undergraduate students at Wayne. Even though I attended the university as a graduate student, I was able to take a few high-level undergraduate courses with juniors and seniors who, for the most part, seemed focused on completing their degree. While it was hard to tell how fellow classmates performed, on the outside looking in, many seemed well-prepared, on time with assignments and active in class participation. However, as the semester wore on, I noticed in one of these courses that the ranks were thinning. Though I do not know the exact reason for this, the class was demanding, which might have led to the attrition. Students who stopped coming may have felt overwhelmed by the class load and the professor’s expectations. At some point, I noticed that one student in particular, who sat next to me, no longer came to class. I was told she was asked to leave for plagiarism. Even though plagiarism is an obvious offense to professors and to people in the academic world, it is not always so obvious to some -- especially to some inner-city students who never learned the skills of proper citation. I do not know if this was the case for the student who was asked to leave, but plagiarism is just one example where certain undergraduate students and university expectations seem to clash. University standards are high, but it seems incoming students from lower-performing Detroit area high schools do not necessarily know what to expect -- or what is expected from them. Another incident that stands out to me, with regard to graduation rates, was when I was working on a story for a journalism class. The article centered on student procrastination and its consequences. I asked one student, who was surfing Facebook at the undergraduate library (UGL), about his study habits. He responded with the typical shoulder shrug and the classic “I don’t know.” Maybe he did not know. Maybe he did not care, or maybe he did not understand the correlation between school success and job success. While this student could not provide a straight answer, it stood out to me that he was on Facebook at a university computer. As I looked around, I noticed many of the students at computer tables were on similar social media sites. In addition, the library was noisy, in contradiction to what one expects from a library. 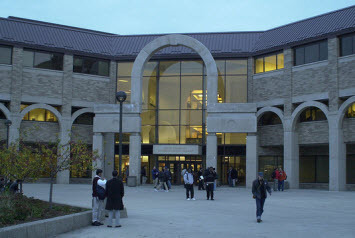 My experiences at the UGL are few because it was not a place conducive to my academic purpose. While the UGL offers invaluable resources, such as the writing center, scheduled group classes and enclosed study areas, for the most part, it serves as a place for social gathering -- more like a student union. When I walked through, there always are students studying, but many others were on Facebook, playing games or participating in other social media. Without question, students need "down time," but it would appear these students were not taking advantage of the resources before them. For many of us, graduate school is a way to pursue our passion on a deeper level and to carry out pertinent research within our chosen field. In many cases, graduate degrees open the door to better job opportunities, higher salaries. Growing up, I was fortunate enough to learn that education was essential. here were no discussions about it; I knew that when I finished high school, I would go to college -- and finish. I grew up with doctors and other professionals, and a similar academic background was expected of me too. While WSU is a large, accredited, research university, it is also a commuter school -- one that serves, in part, an inner-city population. Many Wayne students are first-generation college attendees who may not understand what is expected, which may speak to its low graduation rate as well. What divides those who earn degrees from those who do not is hard to say. I believe it is a combination of challenges, including the mind-set of the student. Some people are raised with the mind-set that, more often than not, education opens doors to opportunity. Some grow up with role models to pattern their own lives after. With that mind-set in place, they start as freshmen and hit the ground running. On the other hand, those without family precedent and the skills needed to perform have much further to go. These students may have the drive and motivation, but lack the roadmap or support network. And yet other students have neither the precedent nor the drive -- making their entry to the college the likely beginning of a detour, not a launch into life. Ms. Hollowell: It's a good thing you didn't extent your search to the Prudy/Kresge or the Science libraries. Outright loud conversations, ignorant behavior and rudeness were the actions of the day. I would either study in the Law Library, or the upper floors of the Science Library. I would attempt taking my laptop to campus (thievery is high) and use the desk computers that you mentioned. Regardless though, I found that too many were utilizing the computers for anything other than social media. As far as the incident of plagarism, it doesn't suprise me. I was adjunct faculty at WSU for many years and had two cases of plagarism. The biggest problem I found, however, wass support from administration, i.e., department chairs and college deans, in appropriately handling the matter. I had one situation where the student was complaining of the D grade I gave him on a paper. He proceeded to pull from his backpack the identical paper and tell me he received a B grade from another instructor for the same paper. I was stunned. I asked the student if he cleared it with the other professor that he was handing in the same paper for two classes (I NEVER allowed that; its not original work for my class if submitted to another and its violates the Student Coduct Code, i.e., plagarism. Additionally, as a graduate student I was never allowed to do this for the very same reason). The student told me he had. I informed him that his grade was now an F for the course and that I was filling charges of plagarism. Needless to say, everyone did their best to dissuade me. The real kicker was where the student still appealed my decision to the associate dean for the college. The dean had misgivings because they stated the student had a 3.5 GPA. I was floored. I told reply the student did not. In fact, the student's barely had a 2.00 GPA. The dean asked how I knew. I stated I found the information from the students academic grade record that all faculty have access to while a student is enrolled in their course. Looking a little embarrassed, this dean said the situation would be handled. I didn't bother to follow up, because I knew what that meant: nothing was going to be done. I could also tell you situations where I gave students extensions on papers and either they were never handed in or the page limit wasn't met. One situation in particular, a student given an extension declared emphatically that the paper didn't meet the page limit and didn't care they failed to do it. I informed the student that the syllabus stated they would lose one letter grade even before I started reading the paper. The reply? So what. I must also mentioned these behaviors are at all colleges and universities, although in varying degrees. As an adjunct faculty member, you are truly a "road scholar." I have the pleasure, and in some instances, the displeasure to teach at several of the schools listed in articles on this site regarding abysmal graduation rates. My evaluation? Too many students unprepared, many, through not all, tenured professors that let students slide by, and administrative leadership not willing to confront the elephant in the room. While everyone will point figures regarding whose fault it is, the fact remains that many students will incur tremendous loan debt, not graduate from college, and heaven forbid, end up with a piece of sheepskin that won't prepare them for the harsh economic reality this state, and the nation, is currently in. I better end this now or the comment section will run out of space. There is much blame to go around. The question is how do we resolve it...and quickly.